vii. Edward DeMill Campbell, b. 9 Sept. 1863, d. 18 Sept. 1925, m. 10 Oct. 1888, Jennie Marian Ives of Cincinnati, Ohio, children, 1: i. Cornelia Hotchkiss Campbell, b. 4 Dec. 1889. "What is this law? It is " the golden chain which binds the universe to the throne of God;" which binds together in one common bond all civilized nations, making of one blood all the kingdoms of the earth; which binds together governments, and states, and all communities, and parents and children, by one sacred bond of protection and obedience. By this is bound together all human society, whereby man is raised from the brutal state of a solitary savage, and made to yield that base liberty to obtain the advantages of knowledge and civilization. In entering that higher sphere he gives up to the community all those powers and prerogatives which are needed to make it efficient for all good purposes. It is not his right now to assert and follow his own unbridled will, to enforce by his own act the claims he may think are justly his, or avenge by his own hand his private grievances. But his welfare is entrusted to a stronger power, able by the weight of numbers to protect him far more efficiently, while it compels him, with all its members, to obey what it ordains for the common good. The power which is held by society to direct and control the conduct of men can never be withdrawn or relinquished. No one can assume to himself any of the functions of the community. If any man attempts to correct evils or redress real or fancied grievances by violence, the law steps in and bids him forbear." James Valentine Campbell was born on February 25, 1823, in Buffalo, New York. While still an infant, his family relocated to Detroit. 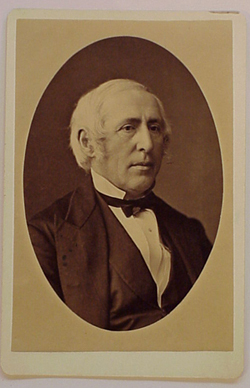 He graduated St. Paul's College, College Point, L. I.,was admitted to the Bench in 1844. He practiced law in Detroit. He is remembered as one of The Big Four in Michigans prestigious Supreme Court history. He served on the Court for 32 years, until the time of his death in 1890. Campbell possessed a talent to teach as well. In 1859, he was chosen as a Marshall Professor of Law in the University of Michigan Law Department and served as first dean of the law school. He taught and influenced many young lawyers for 25 years. Former student and later colleague, Isaac Marston, said of Campbell's teaching, "In the delivery of his lectures, he did not, like the others, state a legal proposition and then seek to illustrate or explain, but from the commencement to the end, he talked in that easy, flowing strain which all who heard him can remember so well, and which made it so difficult to take notes. 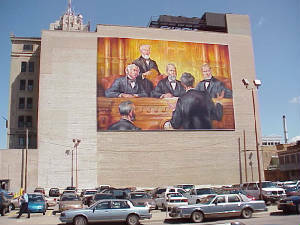 A 60-foot by 90-foot mural of four of the most famous jurists in Michigan Supreme Court history now adorns the south side of the Thomas M. Cooley Law School at 217 S. Capitol, Lansing. The art work, a faithful reproduction of an oil painting donated to the Michigan State Bar some years ago, was painted by Tony Hendrick of Adams Outdoor Advertising in Lansing. 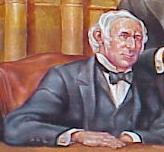 It portrays Michigan Supreme Court jurists (from left to right) James V. Campbell, Benjamin Graves, Thomas M. Cooley, Isaac Christiancy, who served on the court together 1868-1875. The group was known as "The Big Four."